I recently added a beautiful new cookbook to my (always expanding!) 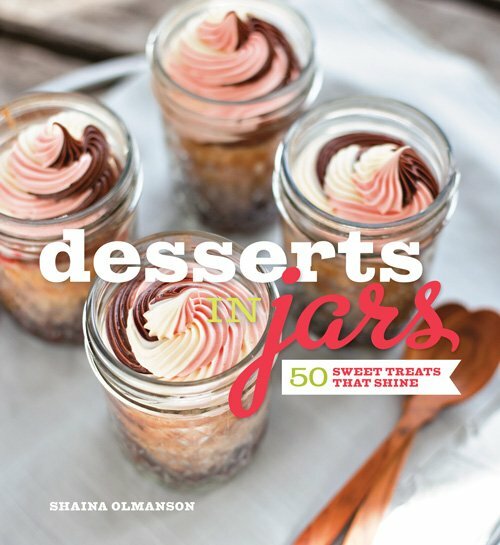 collection, Desserts in Jars by Shaina Olmanson. If you’ve been around here long, you’ll know how much I love baking and serving desserts in pretty jars, so this book is right up my alley! The book is full of tempting treats, but the Cherry Almond Crumble called to me first. 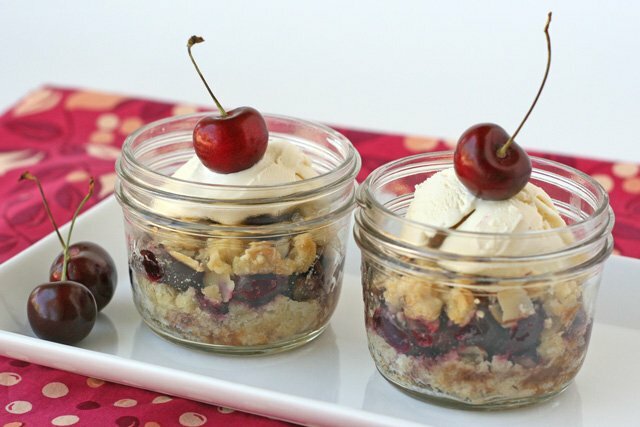 This beautiful and delicious dessert is a perfect way to enjoy summer cherries! 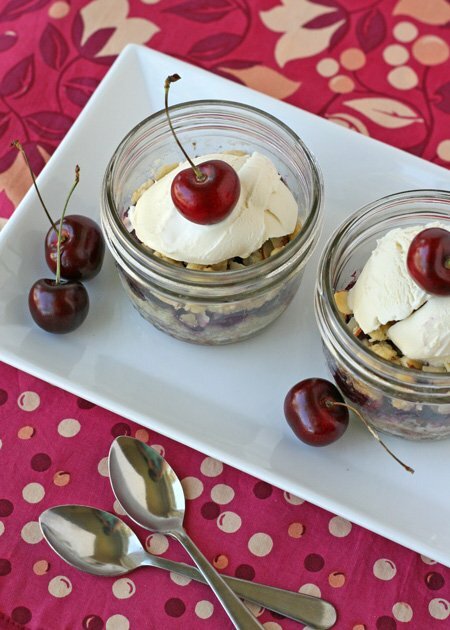 Baking this delicious cherry dessert in small jars allows for easy transport, and a beautiful presentation. In a food processor, or in a large bowl using a pastry cutter, mix together the flour, sugar, baking powder, salt, egg, vanilla extract, almond extract and about 1/2 of the almonds. Add the butter pieces, pulse, or blend until the mixture is combined, and crumbly. Press 3 rounded tablespoons of the mixture into the bottoms of 9 wide-mouth 8 oz. jars. In a large bowl, mix together the halved cherries, sugar and cornstarch. Divide the cherry mixture among the jars. Mix the remaining almonds with the remaining crumble, and add 2-3 rounded tablespoons of crumble to each jar. Press crumble mixture down lightly to keep it in place. Place the jars (2 inches apart) on a baking sheet, and bake for 25-30 minutes, or until the tops of the crumble start to turn golden brown. Enjoy crumble warm, or cool. Top with whipped cream, or vanilla ice cream if desired. 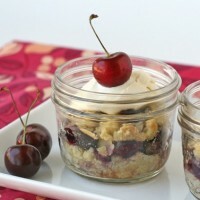 As I mentioned, this yummy recipe is from a beautiful new cookbook, Desserts in Jars. This book is full of delicious treats, from cupcakes to custards, pies to frozen treats! And wouldn’t you know it… I have an extra copy! Author Shaina Olmanson has set aside a copy of this beautiful book just for one lucky Glorious Treats reader! To enter, simply leave a comment below (on this post) telling me your favorite dessert. For an additional entry, share this post on Facebook, Twitter, or pin to Pinterest. Maximum, two total entries. Entries must be left on this blog post. If you are viewing this post via e-mail, click HERE to view this post on-line and comment. Giveaway ends Tuesday, July 24th, 9pm Pacific. Winner will be chosen using Random.org, and notified via e-mail. I have made cupcakes in jars once, and I’ll just say there is a learning curve, but I would love to win this cookbook! I am determined to try again 😉 My favorite dessert is cupcakes!! I love me anything with chocolate & caramel. Coconut added is an extra special bonus! Nothing beats apple pie. mmm! I really love cake. There’s nothing better than a great Italian cream cake! List just one favorite dessert? Impossible! I’m a fan of almost anything chocolate, and very much enjoy a simple fudge brownie delight–homemade brownie topped with ice cream and hot fudge. I love anything with chocolate and coconut! or anything with fresh fruit integrated into it. !! These look delicious! 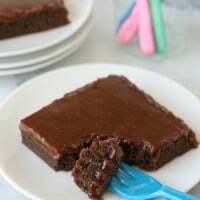 I don’t know how I could possibly pick a favorite dessert, but I think brownies would be pretty high up on the list. What a great idea! Thanks for the giveaway!! I love ANY kind of cupcake- but a rich dark chocolate with a fruity frosting is probably my favorite! love gluten free any dessert, but cheesecake is my favorite. So many desserts so little time. I would have to say pie-lemon meringue, cake-choc. espresso orange. I love seeing what you are doing in your kitchen. Thanks for sharing. Cakes in a jar…how fun!!! I would love to win this cookbook. This would be perfect for Christmas gifts! Just realize I left this comment on the wrong post!! So, hopefully this is the correct one! My fav dessert is my Strawberry Shortcake Panna Cotta thatI make with fresh strawberries, yellow shortcake (ground in food processor) and real whip cream!! Yum!! I like chocolate cake with chocolate frosting. I love homemade banana cream pie…with EVERYTHING homemade! My favorite dessert are nanaimo bars. DELICIOUS! My fave would be grandma’s apple or plum kuchen or mom’s apple pie! Thankfully, I can make both! I have TWO favorite desserts – 1. Strawberry Shortcake on freshly made buttermilk drop biscuits and 2. My family’s chocolate chocolate cake recipe with chocolate buttercream frosting! Sometimes you feel like a chocolate indulgence, and other times you feel like being sweet and light! PS: love your blog! Cupcakes any time of year….sundaes in the summer and apple crisp in the fall. One of my favorite desserts is ice cream! I’m a simple girl at heart! 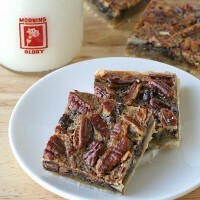 Anything vanilla and with pecans is a winner! Every dessert is my favorite dessert! Baking is such a passion for me. I especially enjoy making and devouring a caramel apple upside down cake or anything that has chocolate it in. It’s so hard to pick just one!! Im a nut lover and enjoy Brownies with walnuts or hazelnuts and vanila Ice Cream or a cold serving of mixed chilled fruits. I love the concept of desserts in a jar. Is an innovative and pretty way of presentation. Glorious Treats is one of my favorite sites for the beautifull and delicious cupcakes and cookies. Ill love to make such a wonderfull creations. Blessings to all bloggers who share such a talent. Greetings from Puerto Rico. I absolutely cannot refuse vanilla cupcakes. They are so angelic and yummy! Wow, I would have to say pie. Among the many choices in that category, I’m not sure I could choose. Maybe lemon meringue, pumpkin, or mixed berry. I absolutely love all desserts that mix chocolate and mint! I love homemade banana pudding! Chocolate, almonds and fruits made so darling! These whimsical treats are enthralling!